125. Friday November 12th 1875. I got the work all done up in good style this forenoon and helped with the dinner In the afternoon Mr Bently and I went to the valley and Hattie came home with him and I stayed down there. Aunt Emma and I visited all the evening. 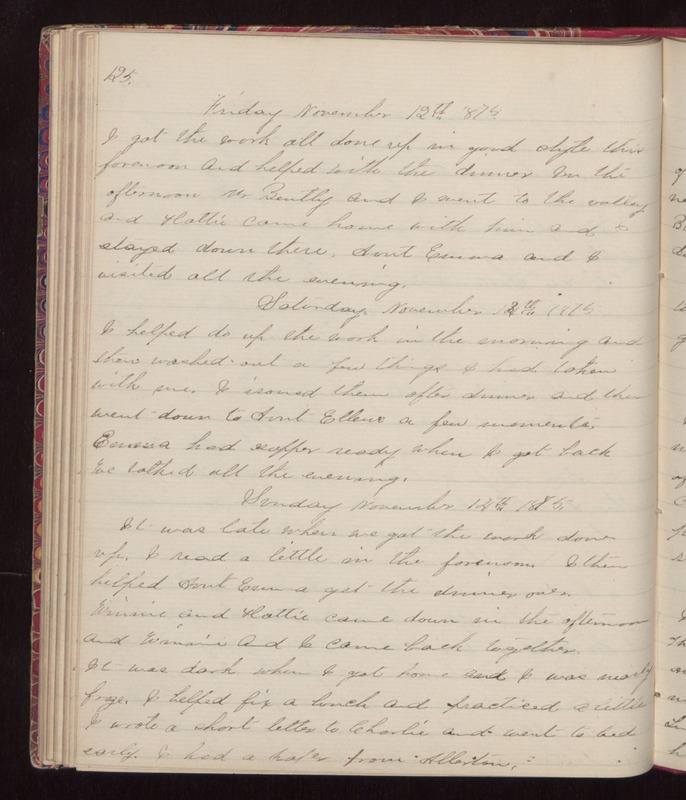 Saturday November 13th 1875 I helped do up the work in the morning and then washed out a few things I had taken with me. I ironed them after dinner and then went down to Aunt Ellens a few moments. Emma had supper ready when I got back We talked all the evening. Sunday November 14th 1875. It was late when we got the work done up. I read a little in the forenoon. I then helped Aunt Emma get the dinner over. Winnie and Hattie came down in the afternoon and Winnie and I came back together It was dark when I got home and I was nearly froze. I helped fix a lunch and practiced a little I wrote a short letter to Charlie and went to bed early. I had a paper from Allerton.